Aesculus flava fruit_05_by_Line1. commons.wikimedia.org (Accessed 7/2017). 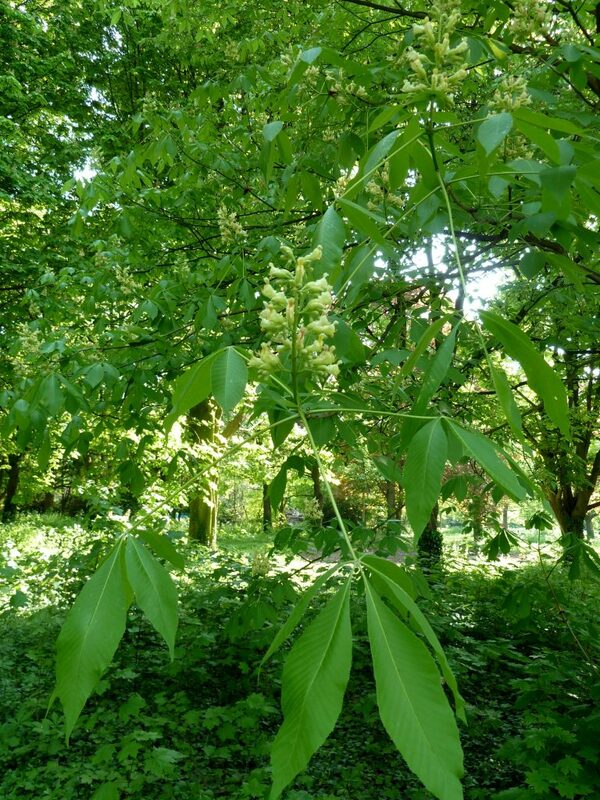 Aesculus flava is a tree to 30 m tall, sometimes a large shrub. Leaves deciduous, opposite, palmately compound, leaflets 5, stalks 0.1-0.7 cm long, blades widest above middle, 10-15 cm long, margin finely toothed, veins straight, young leaves hairy below. 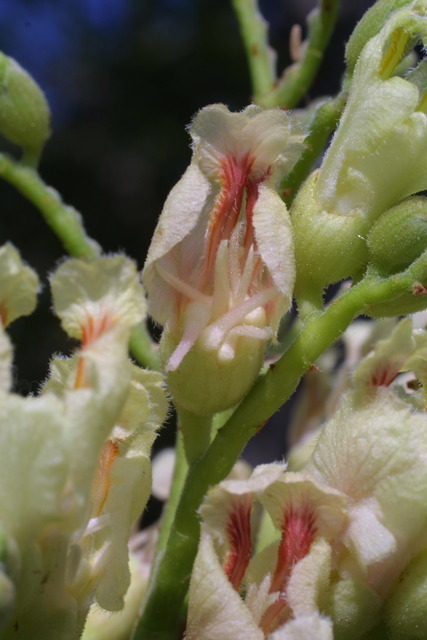 Aesculus_flava, frontal_view_of_flower,I_SB10613. © Copyright Steve Baskauf, 2002-2011 · 4. discoverlife.org (Accessed 7/2017). Flowers dull yellow, or whitish, with red markings, bilaterally symmetrical, sepals 5, lower halves fused, covered with tiny stalked glands; petals 4 overlapping, the larger two to 3 cm long, broad above, narrow at base, stamens 8; inflorescence 10-17 cm long; blooms May-June. 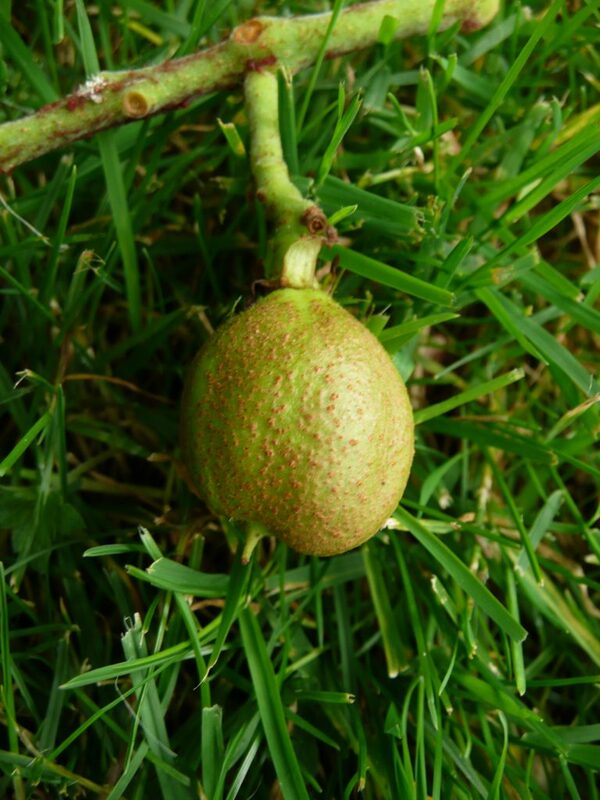 Fruit a large 1-seeded, 3-parted, smooth capsule to 8 cm. Frequency in New York City: Very infrequent. Native to sw. PA and south.